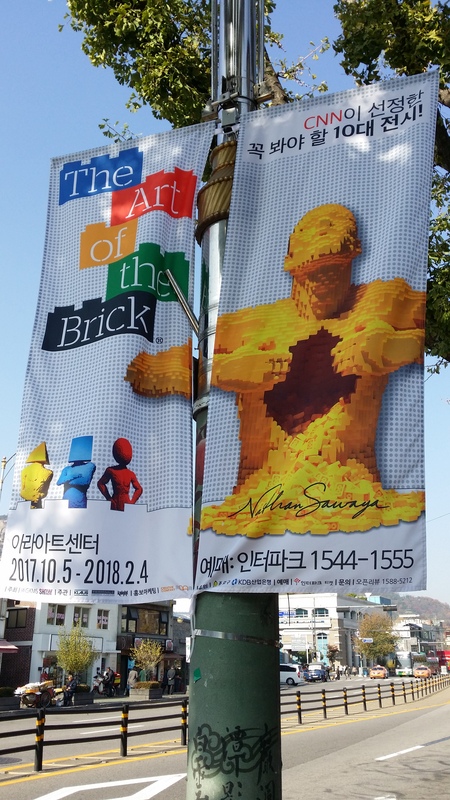 During my recent trip to Seoul, I stumbled upon the posters of “The Art of the Brick” exhibition (in the photo on the left) on my way to the Tongin Market. 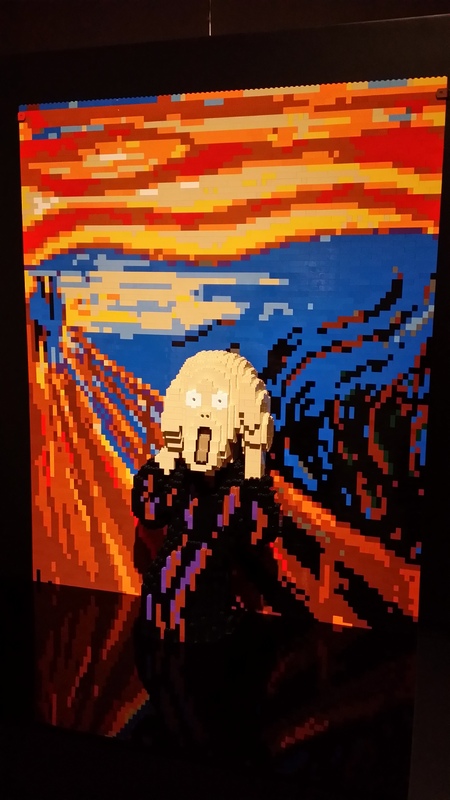 This is the exhibition by Nathan Sawaya, the brick artist who uses Lego bricks to create artworks, and this exhibition has been selected by CNN as one of the top 10 must-see exhibitions and has already been held in different countries over the world. As the exhibition is held in the Ara Art Centre which is conveniently located in Insadong, I went to this exhibition and liked it very much. Let me share some of my thoughts and feelings of this exhibition with you in this blog post. The Lego works I have seen so far are either the miniatures or real-life size replicas of buildings, cities and other things we can see daily like cars, trains, etc. In “The Art of the Brick” exhibition, apart from the miniatures or replicas of some things we can usually see, like the globe, pencil, telephone, flowers, piano, etc., you can also see artworks like various human forms expressing different feelings and thoughts of artist, the artist’s “paintings” using Lego bricks, and renditions of famous paintings (e.g., Mona Lisa, Starry Night, Scream, etc.) and sculptures (e.g., The Thinker, the Great Sphinx, David, etc.). What surprised me is the creative ways in which the artist has used the Lego bricks. For example, the artist created 2-dimensional “paintings” using 3-dimensional Lego bricks. The expression of his abstract feelings and thoughts using concrete artworks created by Lego bricks. While I liked most of the artworks in the exhibition, the artwork I liked the most is the rendition of Edvard Munch’s famous painting “The Scream” (in the photo on the right) – the artist used the colourful Lego bricks to replicate the colourful background of the painting, and while keeping the background in 2-dimensional painting form, the artist created a 3-dimensional figure of the person in the foreground of the painting, making the person standing out even more, thus cleverly turning a 2-dimensional painting into a combination of 2-dimensional and 3-dimensional artwork. On the other hand, beside each artwork, there is a text explaining the thoughts and/or feelings of the artist and/or how the artwork was created. Some of the texts made me reflect on myself and my attitudes towards different matters. So, apart from the artworks, the exhibition also provides some good food for thoughts. You can get a glimpse of the varieties of the artworks displayed in the exhibition held in Paris by watching this video. Some of the artworks in the Paris exhibition can also be found in the exhibition currently held in Seoul.